This book is very special. It tells many new tree stories, revisits well-known heritage trees and provides information and encouragement to help local groups discover and celebrate stories of trees in their area. 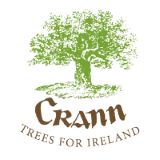 The book – by Ben Simon, who for many years was a board member of Crann – is hardback, 160 pages, illustrated with drawings and both black-and-white and colour photographs and is a must for all lovers of Ireland’s trees. Crann, P.O. Box 860, Celbridge, Co Kildare.